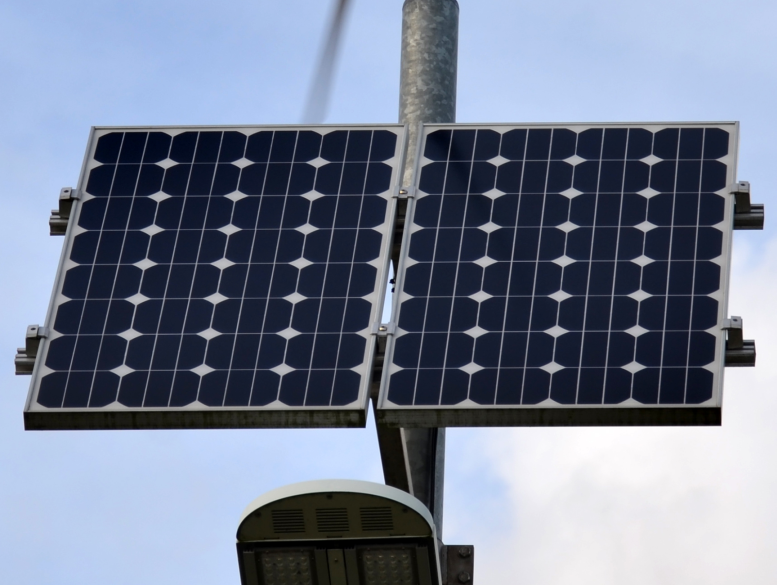 Based on the technology, solar panels are divided into two large groups: crystalline and thin-layer solar panels. Crystal panels are divided to mono and polycrystalline. In the past, it was true that monocrystalline panels were more effective than polycrystalline ones with the same performance. Today, thanks to the developed technology, this difference has disappeared. Their efficiency is the same. It can be said that polycrystalline panels work better with diffuse radiation, whereas, when direct sunlight is concerned, monocrystalline solar cells have better capacity, but these are minimal deviations. 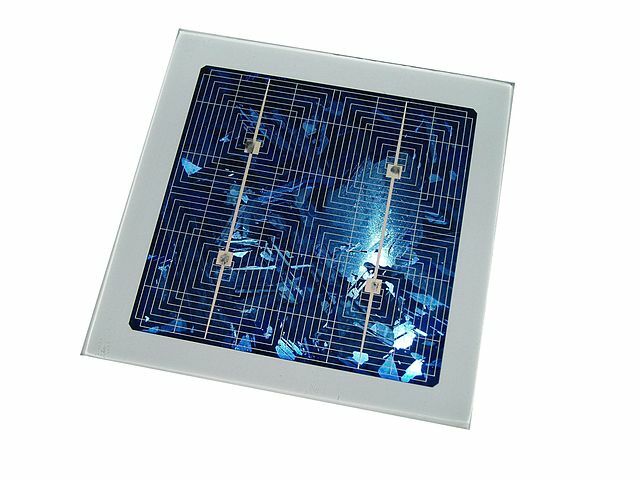 What is Polycrystalline Solar Cell? If larger crystals are formed in the process of growing crystals (usually 6 commonly oriented), and from such a crystal block are cut the plates to produce a solar cell, then such cells are called polycrystalline or multi-crystalline cells. The polycrystalline cell, which is recognizable by its light or dark blue color, is not a monochrome and some cells are lighter and some are darker. In polycrystalline solar panels the corners are not rounded. Cell color differences come as a result of the production process. Multi-crystalline silicon cells are more economically efficient than monocrystalline. The production of these cells takes place in such a way that liquid silicon is poured into molds that are cut into the plates. After solidification crystalline structures are formed and faults are created at the borders, which reduces the efficiency to 10-14% and the expected lifespan is between 20 and 25 years. What is Monocrystalline Solar Panel? If the entire cell volume consists of only one crystal, then such a cell is monocrystalline silicon cell. A typical monocrystalline solar cell is dark black color, and the angles of the solar cell are usually rounded up as a result of the production process and the nature of monocrystalline silicon. When solar panels experienced the first boom on the market, it was believed that monocrystalline solar panels are better than polycrystalline solar panels. There are several reasons for this belief. Historically, monocrystalline solar panels had greater efficiency, and were more present and more accessible than polycrystalline solar panels. However, the widespread belief that monocrystalline solar panels are better than polycrystalline solar panels is simply not true. Every solar panel and solar panel manufacturer should be individually compared, without generalization. Monocrystalline silicon is most often produced by Czochralski process or floating zone technology. The production of monocrystalline silicon is more expensive, but the cell efficiency is higher and ranges from 13 to 17%, and can be said to be the most efficient photovoltaic cell in good commercial use and in good light. The biggest drawback is that the semiconductor is an indirect banned bandwidth, which results in the need for larger layers of active layer to maximize the use of solar radiation energy. Life expectancy is 25 to 30 years, and output power degrades over the years. Thus, after 25 years, it will be about 80% of the power. In case of monocrystalline cell, each cell is made of one piece of silicon crystal. Monocrystalline sticks are extracted from molten silicon and cut into thin plates (vafers). Polycrystalline cells are formed of liquid silicon which is poured into blocks which are then cut into plates. During the solidification of the material, crystalline structures of different sizes are formed where at the boundaries faults appear. Monocrystalline cells are dark black color. Polycrystalline cells are light or dark blue color. The conversion efficiency for monocrystalline type of cell ranges from 13 to 17%, and it can generally be said that in broad commercial use and in good light is is the most efficient photovoltaic cell. Polycrystalline cells have a somewhat lower efficiency, ranging from 10 to 14%. The expected life duration of monocrystalline cells is typically 25 to 30 years, while for polycrystalline it is 20 and 25 years. Of course, as for all photovoltaic cells, the output power is degrading over the years. With monocrystalline cells, the production process is complicated and requires more energy than with polycrystalline cells, so the polycrystalline module is also cheaper. Until recently (2000) the technology of monocrystalline silicon production was dominated by the so-called Czochralski process or float zone technology. The production of monocrystalline silicon is more expensive, but the cell efficiency is higher. Today, this technology is increasingly losing pace with the technology of multi-crystalline silicon (Mc-Si). The advantages of multi-crystalline silicon are smaller capital investment for the production of the waves (thin plate of semiconductor material), higher utilization of silicon by using square volumes that give the more active surface of the module compared to the round or quasi-round form of a monocrystalline wavelength. Mc-Si technology makes it easier to produce large areas of cells of 150 × 150 and 200 × 200 mm, which simplifies their installation in modules. 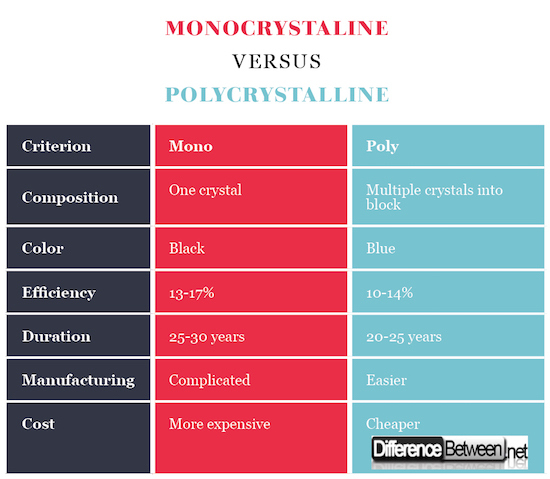 Monocrystalline sells are typically more expensive. Monocrystalline silicon cells can convert 1000 W/m2 of solar radiation into 140W of electricity with a cell surface of 1m2. For the manufacture of monocrystalline Si cells, absolutely pure semiconductor material is required. Monocrystalline sticks are extracted from molten silicon and cut into thin tiles. This way of making has a relatively high degree of efficiency. The polycrystalline silicon cells can convert 1000 W/m2 of solar radiation to 130W of electrical energy with a cell surface of 1m2. The production of these cells is more economical. The silicon is poured into blocks which are then cut into the plates. These cell have lower efficiency. Emilija Angelovska. "Difference Between Poly Solar Panels and Mono Solar Panels." DifferenceBetween.net. April 3, 2018 < http://www.differencebetween.net/science/difference-between-poly-solar-panels-and-mono-solar-panels/ >.